Since our last update, we have received $190 in donations, for a total of $1,230 over four days. Other donations are “in the mail.” Again, we want to thank all of our donors for their support. Remember: Counter-Currents has found a “mysterious benefactor” who will match donations made between now and Halloween up to $6,000 click. HERE  to make your donation. I have been watching the Occupy Wall Street movement with great interest. The organizers, of course, want to “get money out of politics.” Ironically, they can get that message out because they have stacks of money behind them. George Soros, whose head would surely be on a pike if there were a genuine left wing revolution against the oligarchy, is one of Occupy Wall Street’s financial backers through his sponsorship of Adbusters. 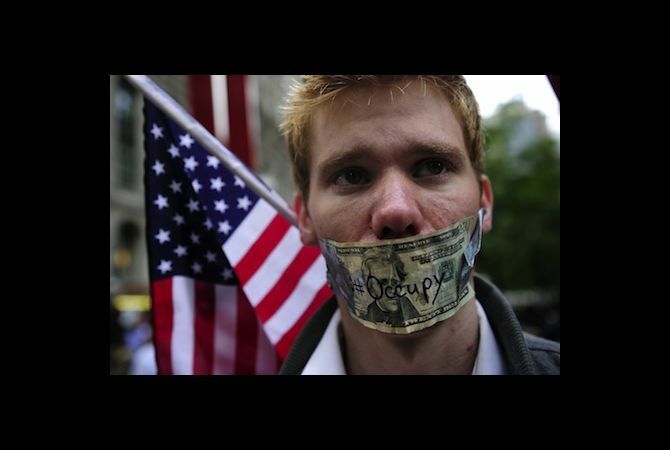 I am convinced that Occupy Wall Street is not about changing the system. It is not about building up steam behind a concrete agenda for reform. Instead, it is about preserving the system by letting off steam that might otherwise be channeled into real change. Occupy Wall Street is taking a great deal of existing discontent with the oligarchy and then simply wasting it by diffusing it in unfocused activism. The only way to focus popular discontent and activism toward real change is through a determinate ideology and concrete goals. But Occupy Wall Street has no real ideology at all. Just vague complaints about capitalism. And Occupy Wall Street has no concrete goals at all . . . beyond Occupying Wall Street and spawning copycat protests elsewhere. John Robb has been making interesting observations  about the “open source” nature of Occupy Wall Street. Occupy Wall Street has certain basic rules, one of which makes it difficult or impossible for anyone to take over the protests and use them to support any specific ideology or set of policies. This openness has allowed people to inject all sorts of competing ideologies into the protests. But it also prevents any particular ideology or leader from becoming dominant. Given that the protestors are overwhelmingly white, Occupy Wall Street does provide opportunities for White Nationalists. There is nothing to prevent us from getting our ideas into the mix. However, there is no reason to think that our ideas will make any headway given the basic nature of the protests. A far more promising angle is for us to ponder how to frame an open-source protest movement that would serve our purposes rather than the establishment’s. It all comes down to the power of ideas, the ability to fundamentally “frame” a debate, a movement, or a whole society and worldview. 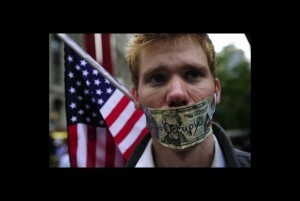 I am convinced that the framers of Occupy Wall Street know very well how shaky the present system is. They know how much popular discontent there is. And they are terrified that somebody will come along and “frame” the situation and focus the discontent in a way that leads to fundamental change. Thus they wish to diffuse this discontent harmlessly by throwing big money behind an intellectually vacuous and unfocused protest movement that is now degenerating (as planned) into anarcho-leftist street theater. We New Rightists, of course, know how to frame the current economic crisis and focus popular discontent toward real change. We know who is responsible and what their game is. And we have a real alternative, a Third Way. Beyond left and right, socialism and capitalism, is nationalism. Whether you call it National Socialism or National Capitalism, Social Credit, Corporatism, Distributism, or Producer Capitalism versus Finance Capitalism, the Third Way boils down to this: we believe in private property broadly distributed, the moral rights of producers to the fruits of their labor, an end to usury and other forms of financial parasitism, and economic regulations to make sure that private interests (in low wages and open borders, for instance) do not conflict with the interest of the nation. Imagine if we could get that message out there. We have all the right ideas. For an overview, see Kerry Bolton’s articles  on Counter-Currents. But we don’t have the money to get these ideas to our people. Instead, we have the utterly grotesque spectacle of White Nationalists sending money to Ron Paul, a libertarian individualist whose only possible objection to Jewish media power would be if the checks did not clear. And Ron Paul is the best politician the system will tolerate.